A Ghost a Day : 365 true tales of the spectral, supernatural, and-- just plain scary! by Maureen Wood and Ron Kolek. A London Year : 365 days of city life in diaries, journals and letters / compiled by Travis Elborough & Nick Rennison. This book is a fascinating idea. For every day of the year you can read diary entries written by people who lived in London. Craft-a-day : 365 simple handmade projects by Sarah Goldschadt. If you love crafts this might be the book for you. 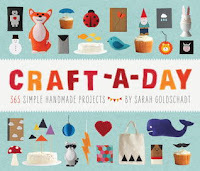 Sarah's book teaches you a craft a day for a year and is set up with weekly themes. Week 1 is snowflake week and for seven days you’ll make a different craft with the same snowflake design. The crafts are all very basic but it is a cute idea.